The range of colors in the flowers of Iris ensata is extensive: white and almost all shades of pink, blue, blue-violet and red-violet. Most of the colors provide a strong contrast to the yellow signal spot at the base of the styles. Yellow, however, is the one color that eluded hybridizers. Many attempts have been made in the past to get yellow-brown into this iris by using Iris pseudacorus. Dr. Osugi bred the first of these hybrids, and the seedling first bloomed in 1962. It was named 'Aichi no Kagayaki.' It has elegant flowers that are a rather pale but clear yellow, with I. ensata shape and I. pseudacorus signal markings. It is, of course, sterile. Mr. Ueki bred the second hybrid in 1971, and he named it 'Kinboshi.' I decided to start interspecies hybridizing using I. pseudacorus and I. ensata in 1993. I will introduce you to my F1 hybrid cultivars in this article. During the first stage from 1993 to 1995, I collected many strains of Iris pseudacorus seed from seed exchanges of the British Iris Society (BIS) and the Species Iris Group of North America (SIGNA). In the second stage, 1996 to 1998, I mixed pollen from several Japanese iris cultivars and put it on about 100 stigmas of the various Iris pseudacorus clones. The results of these crosses prompted me to select a special Iris pseudacorus clone, which I named 'Gubijin'. Although 'Gubijin' is aneuploid: 2n=35, it is a very fertile pod parent and excellent at setting seed. About half of my F1 hybrid seedlings bloomed the year after they germinated in pots in the spring. The leaves of these seedlings were almost green, showing little yellow, and the plants demonstrated hybrid vigor and rapidly increased in size and number. I noted two significant features of the seedlings from 'Gubijin.' First, some of the F1 seeds from 'Gubijin' germinated in their pods in autumn. Second, some of the 'Gubijin' seedlings, those resulting from pollen taken from white I. ensata, have white flowers with a yellow signal. This led me to conclude that 'Gubijin' possesses a gene for white color in heterozygous condition. The third stage of my interspecies hybridization program began in 1999. I made selective crosses using 'Gubijin' and selected Japanese iris cultivars with flowers of various color and color patterns. I obtained about 1,200 hybrid seeds in three years. I have selected about 20 beautiful F1 hybrid plants from approximately three hundred seedlings that have bloomed. These include hybrids with flowers of near white with blue halos; yellow with dark veins; bicolor yellow and creamy brown with lavender veins; yellow with crimson sanding: yellow with blue margins; and lavender-pink self. All of the flowers have beautiful blue halos around yellow signals. I named their hybrid plants "Eye Shadow Iris" because the blue halos remind me eye shadow used by women to appear more beautiful. It is unfortunate, as in the case of most wide-cross hybrids from diploid parents, all of the "Eye Shadow Iris" are sterile. 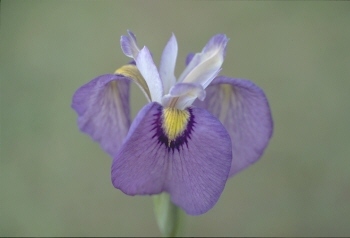 I will, however, be able to select many plants with unique flowers every year without resorting to embryo culture because 'Gubijin' is a very fertile pod parent and Japanese irises have so many colors and patterns. 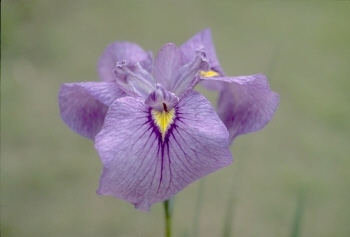 "Eye Shadow Iris" may make a new wave in the iris world.